This entry was posted on November 5, 2008 at 11:26 am and is filed under Eclipse, problems. You can follow any responses to this entry through the RSS 2.0 feed. You can leave a response, or trackback from your own site. Super! Just started with eclipse-development and had this problem… My google-quest got me here using searchterm “eclipse plugin development Generic”. Awesome… i am a beginner in Eclipse plugin dev and you saved a lot of tension for me ..
I’m surprised this isn’t a more common problem. It didn’t work with either my Eclipse 3.4 Ganymede install or the IBM RAD 7.5 equivalent. While using the ‘Eclipse for RCP/Plug-in Developers Galileo (v3.5)’ (eclipse-rcp-galileo-linux-gtk.tar.gz) I hat the same problem. But after updating to ‘Eclipse for RCP/Plug-in Developers Galileo (v3.5-SR1)’ (eclipse-rcp-galileo-SR1-linux-gtk.tar.gz) open schema’s and show description is working as expected. 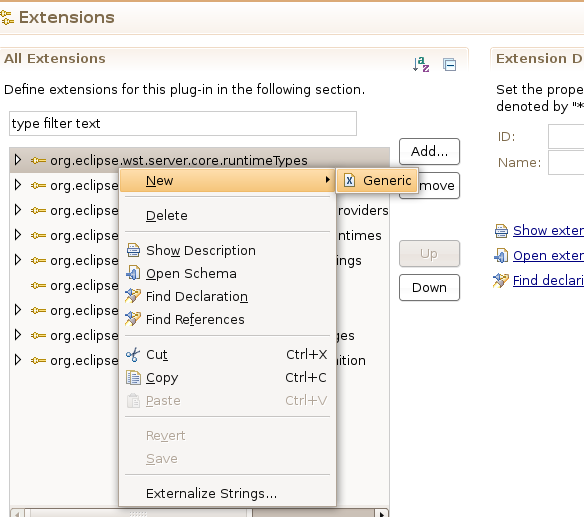 I added “org.eclipse.ui.source_3.5.1.M20090902-1000.jar” in plugins folder, it works! Thanks. This was very useful for me. Please help me. Spent so much time on this problem. I have eclipse 3.4 Ganymede. I checked my eclipse plugin directory and i could see org.eclipse.ui_3.4.2.M20090204-0800 . Is this the source that you are all talking about ? This file is already in my directory but i am still having the problem. If this is not the source file, where should i get the source file ? I am very new and please explain clearly. No that is not the file. The required file will have the word “source” or “src” in its filename. Many many thanks for your response. so where can i get that file. It seems i dont have that file in my directory. when i search for eclipse source file, i find my self in some repository pages and i dont know which one to download. It seems eclipse is searching for something blahblahblah.exsd . this is just an example. where should i find its source ? it might be easier for you to download the SDK version available now (galileo sr2) rather than finding the source bundles for ganymede release. Eclipse ppl archive their older releases to different location and sometimes these locations are hard to find dude. Only worked with Eclipse RCP. And I do not know why. ( http://archive.eclipse.org/eclipse/downloads/drops/R-3.6-201006080911/eclipse-platform-SDK-3.6-win32.zip )and store at folder:F:\Program Files\SDK, after unzipping, the folder look like:F:\Program Files\SDK\eclipse\plugins. 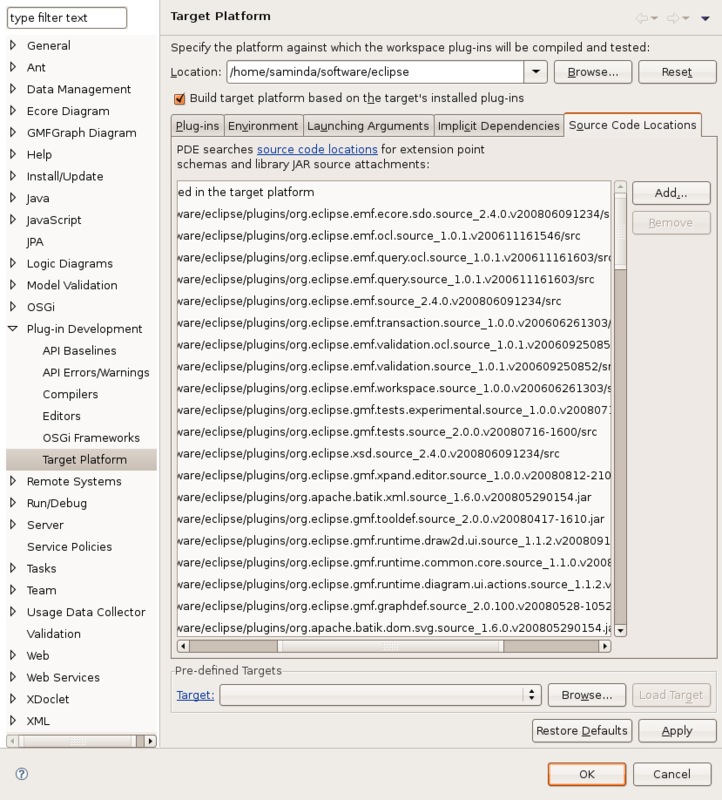 then add location to the target platform mentioned before, be sure that correct location is :F:\Program Files\SDK\eclipse, not the location F:\Program Files\SDK\eclipse\plugins,the latter is not workable. Follow the wizard, restart Eclipse. Done.